Tens of thousands of Iraqi Christians who have fled the Islamic State terror group to neighboring countries such as Jordan have said they are stuck in limbo, with nowhere to go and limited ways to provide a living. Pope Francis has condemned the world's silence on the issue, while an Iraqi archbishop has said that Christians in the region are hated because they want to keep hold of their faith. "The Church is unable to offer and guarantee the fundamental security that its members need to thrive. It is no secret that hatred of minorities has intensified in certain quarters over the past few years. It is difficult to understand this hate. We are hated because we persist in wanting to exist as Christians. In other words, we are hated because we persist in demanding a basic human right," His Exc. Mgr. Bashar Matti Warda, C.SS.R., Archbishop of Erbil, said in a statement to Fides News Agency. 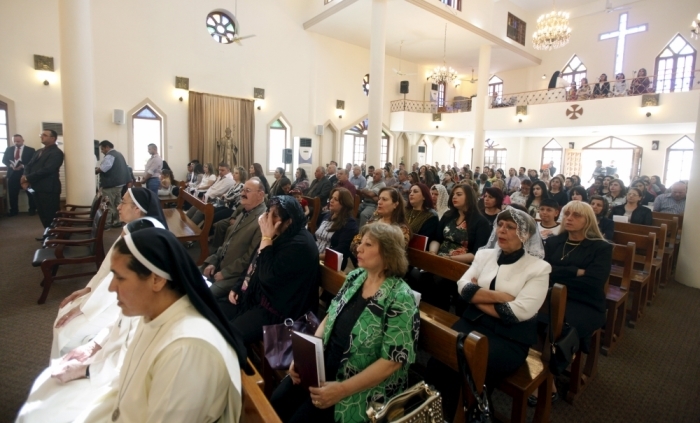 The Associated Press reported on Sunday that close to 7,000 Christians from northern Iraq alone have fled to Jordan. They have not been granted permission to work and have not been resettled to the West as hoped, leaving them in a state of limbo. "We've lost hope in everything," said 67-year-old Hinda Ablahat, who lives with other refugees in a church shelter in Amman, the capital of Jordan. "We've been sitting here for a year and nothing has happened." "Everyone has forgotten us," added 25-year-old Johnny al-Behno. The refugees receive assistance from nonprofits such as Caritas, a Catholic charity, but the need remains huge. IS has given Christians in both Iraq and Syria little choice but to abandon their homes, where they had lived for generations. The terror group has been forcing religious minorities to convert to Islam, pay heavy taxes, or face death. Last week Pope Francis urged the world to be more attentive to the dire situation Christians and other religious minorities find themselves in Iraq and the affected regions. The Vatican leader thanked those "who took on the care of these brothers and sisters, not turning their gaze away." He added that the Christian communities in Jordan who are helping the refugees "proclaim the resurrection of Christ by sharing their suffering and giving them aid." "You bow down to their suffering, which risks suffocating hope," Francis added. The humanitarian need continues mounting, however, with the U.N. High Commissioner for Refugees noting that more than 57,000 Iraqis have sought refuge in Jordan. Facing high unemployment rates, Jordanian officials have said they cannot afford to integrate the hundreds of thousands of Syrian and Iraqi refugees into its labor force. In his statement, Warda noted that the massive immigration is leaving the church in Iraq weaker, which he called a "deeply sorrowful reality." "We who are part of the church hierarchy are very often tempted to encourage our parishioners to stay – keep the presence of Christ alive in this special land," he said. "But truly I and my brother bishops and priests can do no more than to advise young mothers and fathers to take all the necessary considerations into account and to pray long and hard before taking such a momentous, and perhaps perilous, decision." The Iraqi archbishop called on the Church to pray for all refugees around the world, and to use relationships and networks to raise awareness and offer help to the historic communities that are now deeply in trouble. Why Is the World Turning a Blind Eye to the 'Eradication' of Christians in the Middle East?